Lady ActiveSG Gym User Complains Of Gender Discrimination; Disallowed To Perform Barbell Hip Thrust Exercise – Sinking It In! 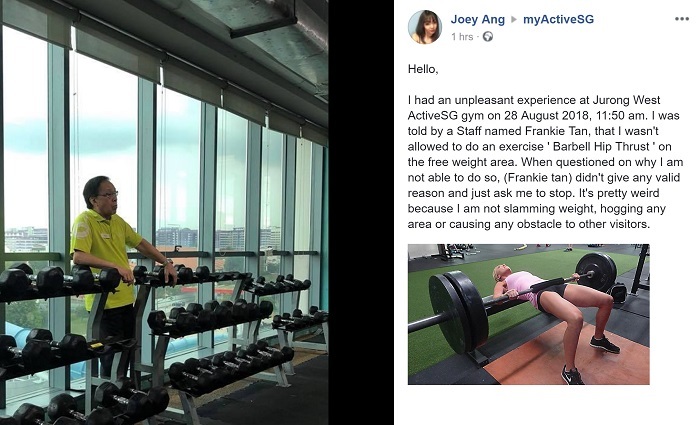 Gym user Joey Ang complained about her discriminatory experience she encountered at the Jurong West ActiveSG Gym in Singapore. She alleged that a male staff named Frankie refused to allow her from doing a barbell hip thrust and did not give her a valid reason for it. Joey maintained that she was not machine hogging or causing inconvenience to other users but was unreasonably told to stop doing her exercise anyway. She wonders if Frankie was discriminating against her due to her being a female as she has seen guys doing the same exercise move in the gym and none of them were told to stop. Joey speculated that perhaps Frankie was afraid to confronting intimidating guys working in the gym and chose to pick on a female instead.